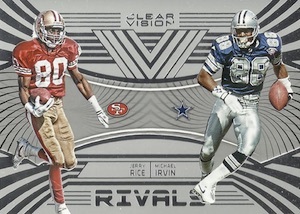 2016 Panini Clear Vision Football aims to stand apart from many of the other NFL releases thanks to a product comprised solely of acetate cards. 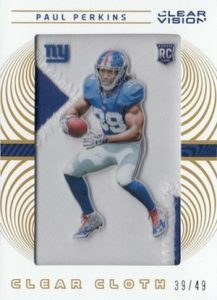 Each hobby box includes one numbered hit. The base set includes a full offering with a large background design along with a team logo. Collectors can also find 30 Team Variations. A total of 70 rookies join that main set with tiered rarity. The first 50 cards are limited to 999, while 15 players are numbered to 399 and the final five players have only 99 copies. 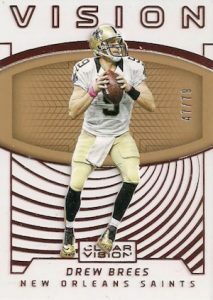 All the hits in 2016 Panini Clear Vision Football are numbered to 99 or less. Doubling from 2015, autographs average four per 18-box case. 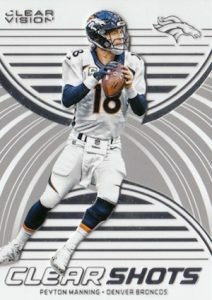 Visionary Signatures showcase a trapped autograph from all-time greats like Peyton Manning, Emmitt Smith and John Elway. Looking to the future, Clear Choice Jersey Autographs feature the 2016 rookie class with an added jersey piece. 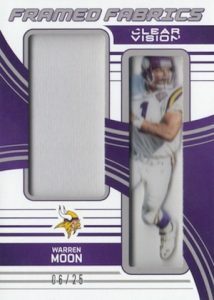 Low-numbered parallels are found for each. 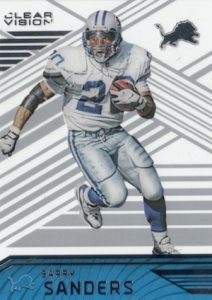 Also focusing on the retired legends, C-Thru Signatures (#/50 or less) cover names like Barry Sanders, Brett Favre and Jerry Rice with a trapped autograph and new design. 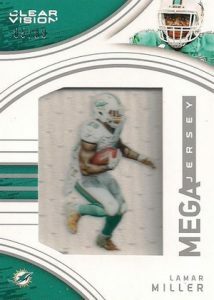 The memorabilia inserts in 2016 Panini Clear Vision Football include Clear Vision Mega Jersey (#/99 or less) for young stars and Framed Fabrics (#/99 or less) for vets and retired players. Clear Change Dual Jersey pairs a current relic alongside that of a former team jersey piece for the player. Rookie Clear Cloth looks to the 2016 NFL Draft class. Prime and Tag parallels present more limited versions for the relic inserts. 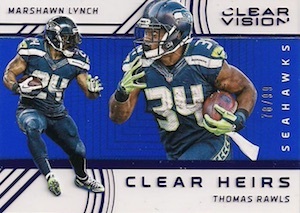 Closing things out for 2016 Panini Clear Vision Football, traditional inserts average one per box and include Clear History, which documents three key names from one team. 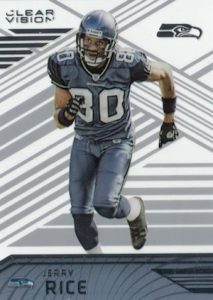 Several color parallels are numbered to 99 or less. FRAN TARKENTON 2016 PANINI CLEAR VISION AUTOGRAPH AUTO #1 5 -VIKINGS!! COREY COLEMAN 2016 PANINI CLEAR VISION ROOKIE GAME JERSEY AUTOGRAPH # 75 BROWNS! 30 cards. Variations feature different teams than the base versions. Card have nice design. Inserts with raised graphics are nice as well. 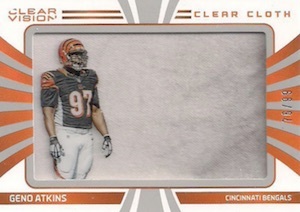 Love the see through thick cards. Parallels nothing special just really color change. Got 4 stars only because its almost impossible to get full set without spending alot of money. 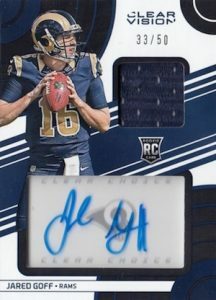 Went through a full case and didnt even get one rookie /99. I get their are only 5 rookies /99 but still. Other than that a solid product.